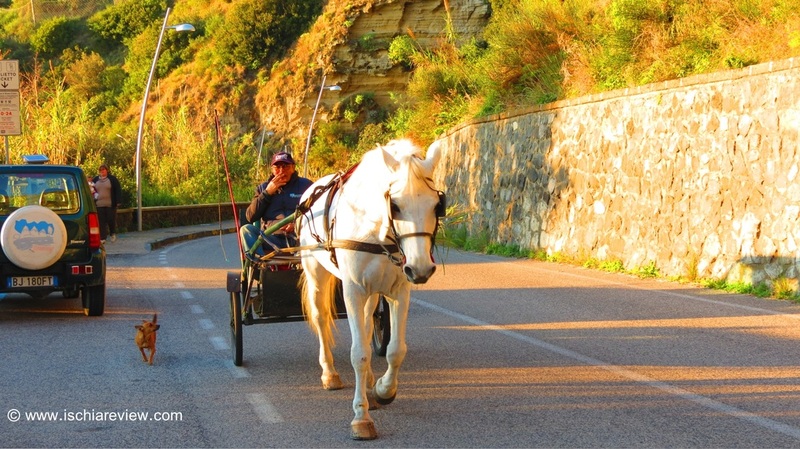 Horse, Cart and Dog in Ischia! Welcome to our Ischia blog, Good Morning Ischia! Here you can see the entry for Thursday 2nd January 2014. It's a slightly cloudy start to the day in Ischia, there's a thin grey belt covering the island itself but looking out to sea it's fairly bright with the islands of Ventotene and Santo Stefano clearly visible. Yesterday was a gorgeously warm day full of sunshine but turning a bit colder as soon as the sun went down, (unsurprisingly). Today feels much cooler with the cloud cover so we're looking at a maximum of 15° Celcius (58° fahrenheit) for the afternoon and dropping to a minimum of around 13°C (55°F) this evening. Today's photo was taken on the road down to Maronti Beach in Barano, the beautiful white horse drawing the cart up the hill with faithful dog in tow yapping away to show that he can keep up with his bigger friends. There were lots of people out and about yesterday, making the most of the great weather and this particular scene was a nice reflection of the cheerful scene. January the 1st is a national holiday in Italy and it's traditionally a day spent with the family, playing games at home or taking walks and chatting to friends. There were even some people swimming in the sea down at Fisherman's beach in Ischia Ponte as part of an annual ritual to bring good luck, it was really nice out yesterday but let's not forget it was New Year's Day and jumping in the sea was no mean feat! So now that Christmas and the New Year are over you'd think things would steadily start getting back to normal but the festive season in Italy lasts a bit longer than in most places as we head towards the feast of the epiphany on January 6th which is another national holiday. The feast is also known as "La Befana" and I'll be explaining more about that over the coming days. Ok that's all for today, have a great day wherever you are and drop us a line if there's anything you'd like to know about Ischia.